In a previous article, I talked about the nine items you and your dog will absolutely need to get your training under way. Once you’ve got the items your pet needs, the first thing you might want to focus on will be housebreaking and crate training your pet. These two things will make them a lot easier to live with at home and help you minimize the chores you have to do that concerns your dog. House training your dog involves teaching your pup not to do their business inside the house. They have to learn that your home is not their toilet. Luckily, by forming a routine with their feedings and your consistency, you can perfectly schedule the times they have to go so it nicely coincides with their walks. Start your housebreaking training when your pup reaches 12 weeks if you have a puppy. If you have an older pet, you can start training them right away. Keep a regular feeding schedule for your pet. Take their food away in between feedings to fully regulate their digestive systems. Start the housebreaking by taking your pet outside as soon as you wake up, after their meals, every time they wake up from a nap, before bed, and right before leaving them alone. These are the likeliest times of the day when they have to go, so they’ll associate having to do their business outside. Take them to the same spot where they do their business so they can recognize their scent that will prompt them to go. Praise and give your pooch a treat every time they do their business outside. Aside from the normal urination, however, your dog might also exhibit submissive/excitement urination. This is a normal behavior in dogs that let them tell others that they’re not threats and most pups tend to outgrow the behavior as they get older. However, if your pup didn’t kick the habit as they get fully house trained, make sure to check whether the behavior is being caused by an ailment. You need to find the cause to best address the problem, and if it’s brought by an illness, you have to treat it right away. If it’s not caused by a sickness, you should then teach your pup that they shouldn’t get overly excited. Pointedly ignoring them when they get too eager for your attention helps as well as keeping play times low key and relaxing. 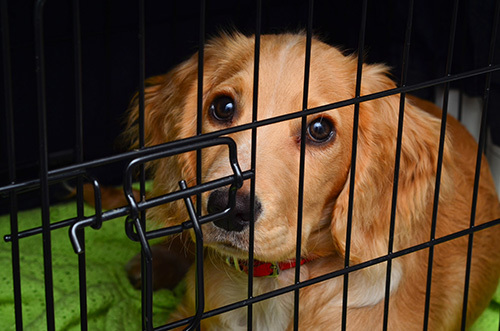 Crate training is another essential thing your pet should learn as it can give them a safe place to retreat to as well as help making traveling with them easier. The goal here is to make your pet feel more comfortable in their crate, so they can retreat to a familiar spot wherever you guys may be. To do this, you have to make sure that they fit nicely in their crate and that they can get comfortable in it. Many dog owners believe that crate training is not necessary. Their belief if often time rooted in the assumption that putting a dog inside a crate is unpleasant for the dog as they would, particularly since untrained dog may be reticent in doing so. The truth is that a crate can become a safe zone for the dog to retreat in, and not the prison some think it might be. Once they start showing interest to the crate you can lure them to it by throwing treats inside it or near its entrance to further entice your pet to it. You can also teach them to get in the crate with a command to make things easier for you later on. Treats are particularly useful, so make sure to also reward them with some every time they step inside their crate. Feeding your pet inside the crate can also help them feel better at ease inside one.